I am dedicating this post to a very dear friend, Erika McDonald who can light up a whole room with her beautiful smile. Erika is a very dear friend and has brought me a little gold treasure all the way from her trip back home to Sweden for the summer holidays---chanterelle mushrooms. Erika has mentioned it has been one of the best years for mushrooms in Sweden because of all of the rain. I have tried many of chanterelle mushrooms and none as so very sweet and aromatic as the ones from Sweden. It is not a requirement that you go foraging for your own wild chanterelle mushrooms in the forests of Sweden to have this delicious dish, but that if given the opportunity, you should definitely go (and go with a mushroom expert as there are many dangerous look a likes out there). 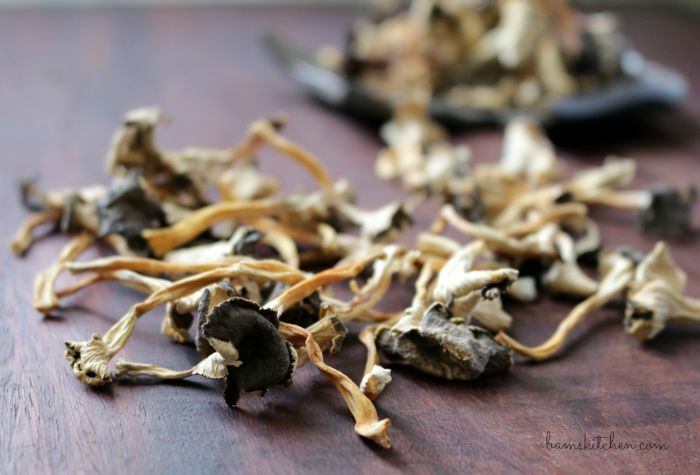 Alternatively, you can use fresh or dried chanterelle mushrooms that you can find at your local market. 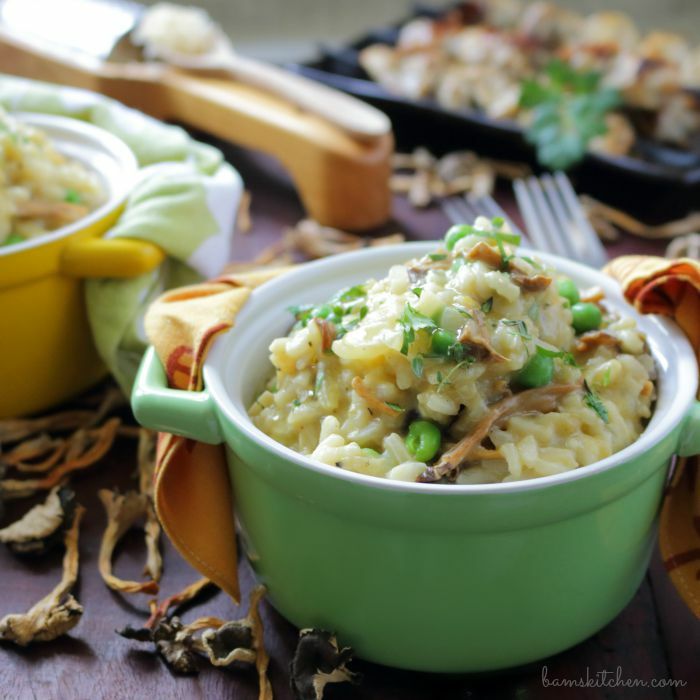 You are just going to love this chanterelle mushroom risotto as it super creamy, slightly sweet and earthy from the chanterelle mushrooms and is one of those super comforting dishes that not only feed the body, but feeds the soul. 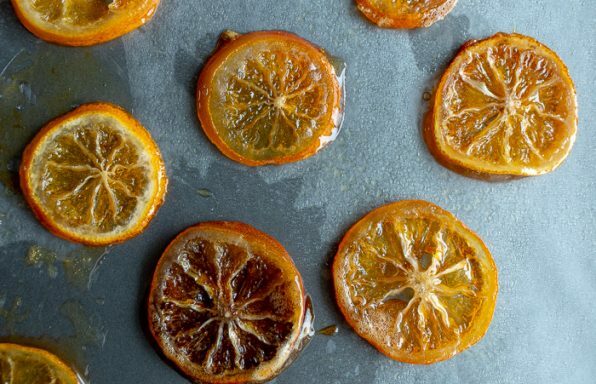 Each bite is like getting a cozy hug from your mom. 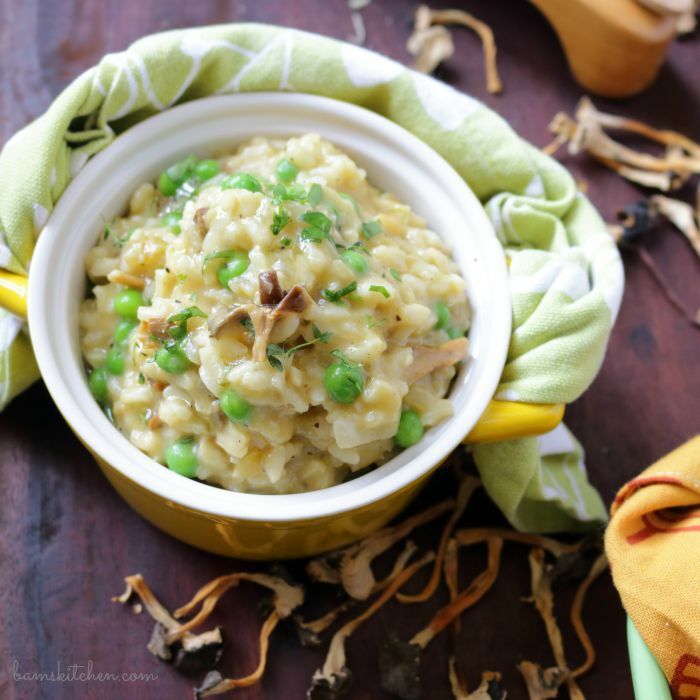 The Autumn weather is right around the corner and the days are going to start to get shorter and the nights will start to get cooler and a bowl of chanterelle mushroom risotto will warm you right up. You know what is even better? 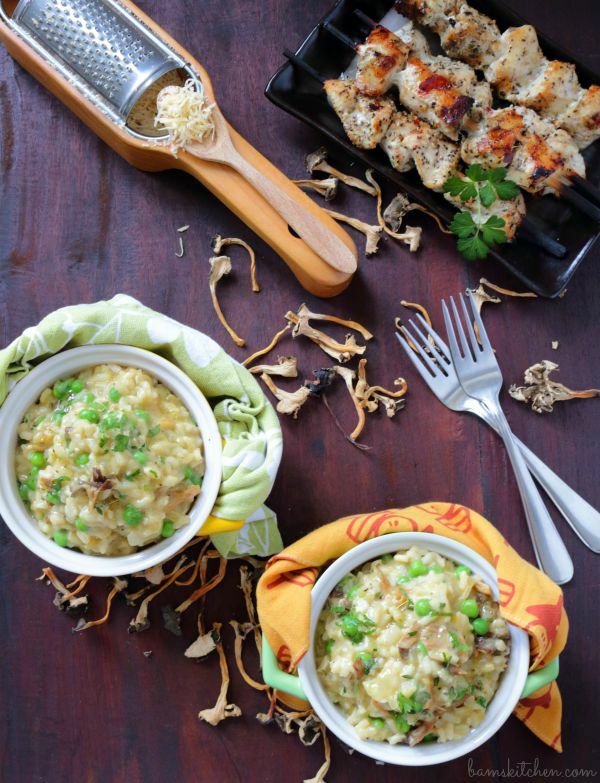 I made some quick and easy Chicken Skewers on the inside grill and served them with the creamy Chanterelle Mushroom Risotto and it was out of this world. 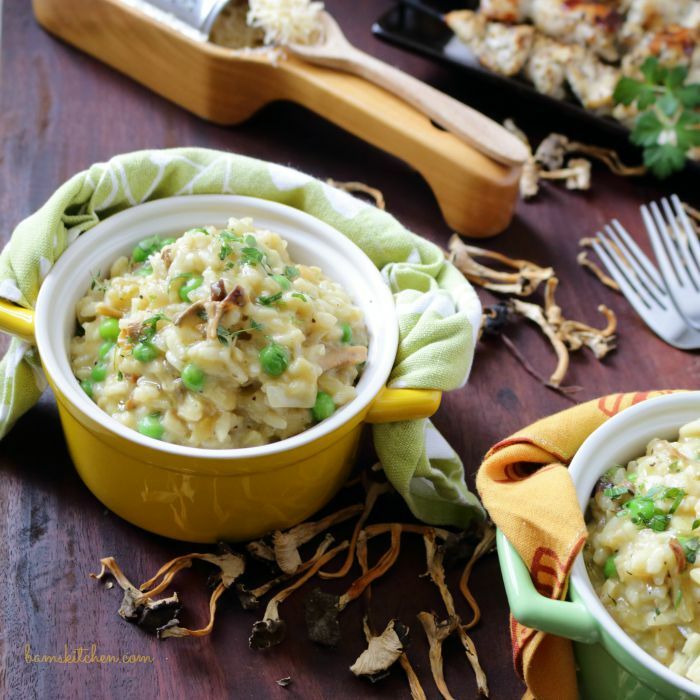 I would take a cube of the savoury grilled chicken and dip into the creamy chanterelle mushroom risotto and oh my goodness that is so good. It is not required but it really was the best darn combination I have ever had. 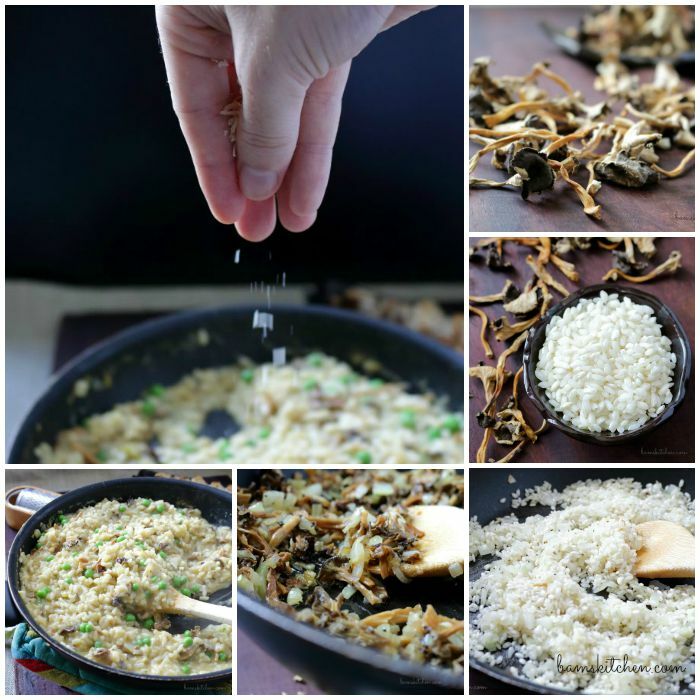 Chanterelle Mushroom Risotto is gluten-free and can easily be made diary free just by leaving out the parmesan cheese as it is so good, you won't even miss it. Of course these little chanterelle mushrooms needed to be a highlight of a dish. 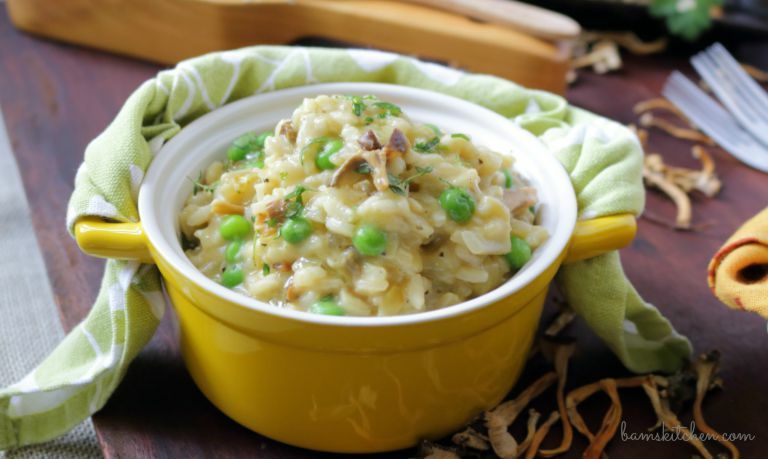 There is nothing like the slow stirring of your creamy risotto to bring some romance into your cooking. There is something very sensual about watching my old wooden spoon slowly stir into the arborio rice to incorporate the wine and chicken broth. It really is a labor of love. I can't be bothered to check the kids homework, answer any Bam's Kitchen questions as for these 30 minute of time it is all about me and the food. I am doing Mindful Food Meditation. If you have not heard about Mindful Food Meditation, then let me get you turned on to this new craze. 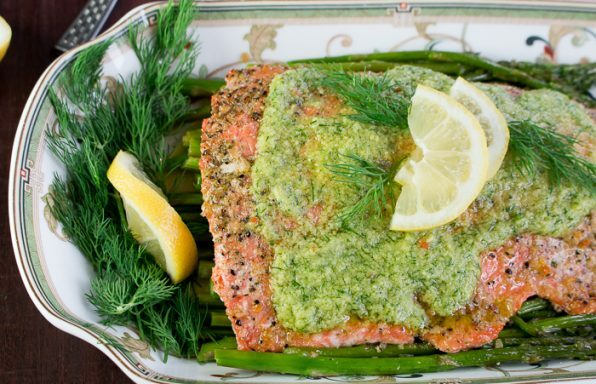 Mindful Food Meditation involves you use cooking, baking and sautéing to decompress and remove your life worries away. I know all of you have been doing this for ages but have never really thought about the positive influences of cooking for your family. Mindful Food Meditation is way cheaper than expensive "therapy". Feeling stressed? Knead and bake some bread! Feeling stressed? Pulverize your spices with your mortar and pestle. Feeling stressed? Slowly stir your risotto. Feeling Stressed? Pound a chicken breast flat. You get the idea! Have you ever noticed that Foodies (Yep that is you guys) are some of the nicest people you know? You see when we get frustrated about work, school or such we don't take it out on our team mates, family or friends we just beat the "@#$%" out of a chicken breast and life goes on as normal as can be. See, don't you feel better already? So let's get on with our Mindful Food Meditation... As you will need a little white wine for the risotto, I pour myself a glass or 2, during the stirring process and listen to music. 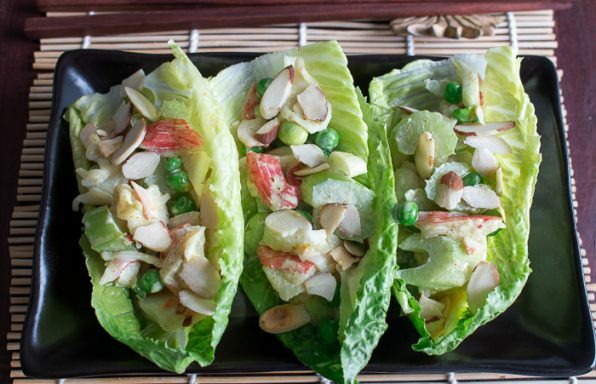 30 delightful minutes of Mindful Food Therapy....stirring... deep breathing...letting the day stresses just melt away... Before you know it, dinner is done. I am totally stress free as I have practiced Mindful Food Meditation, maybe the wine helped a little bit too, and I have a delicious dinner awaiting my family. Life is Good! 1Add the hot water to submerge the dried chanterelle mushrooms and let step for about 15 minutes until softened. (Do NOT drain all of that precious chanterelle liquid as you are going to use that later on in the risotto chicken stock) Drain chanterelles and roughly chop. 4Add the arborio rice and mix and stir until the rice until it is coated well with the olive oil and then add the white wine and turn down your heat to a medium heat and continue to stir the rice slowly and gently until about 75 percent of the wine has been absorbed. Now start adding one ladle of hot chicken stock at a time into your rice and slowly stirring over a medium simmer while allowing the liquid to absorb. When about 80 perfect of the chicken stock has been absorbed add another ladle of chicken stock and continue stirring. (Drink more wine and enjoy this Mindful Food Meditation moment) Repeat this process until the rice is aldente. 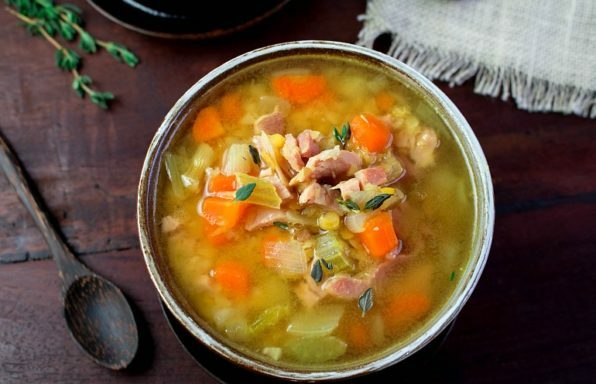 Depending on how high your heat is and how hot your chicken stock is this can take between 30-40 minutes. 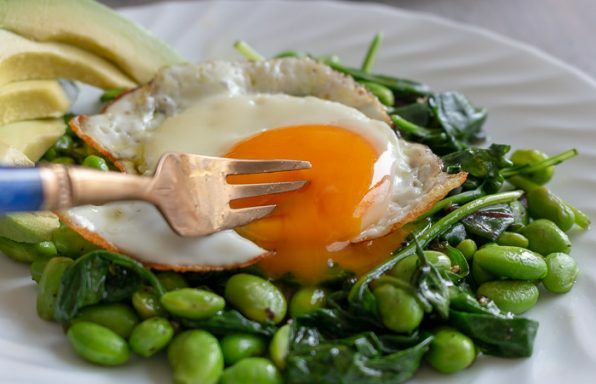 If you make just one serving it might only take 20 minutes and if you increase this from 2 to 4 servings it can take more like 45 minutes to reach aldente. Do not overcook. 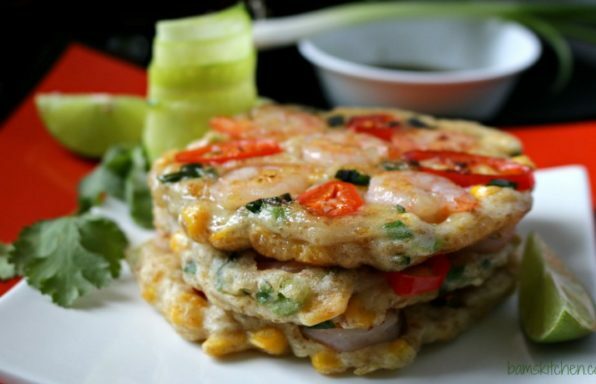 You want your rice to be a little firm but very creamy and not dry. 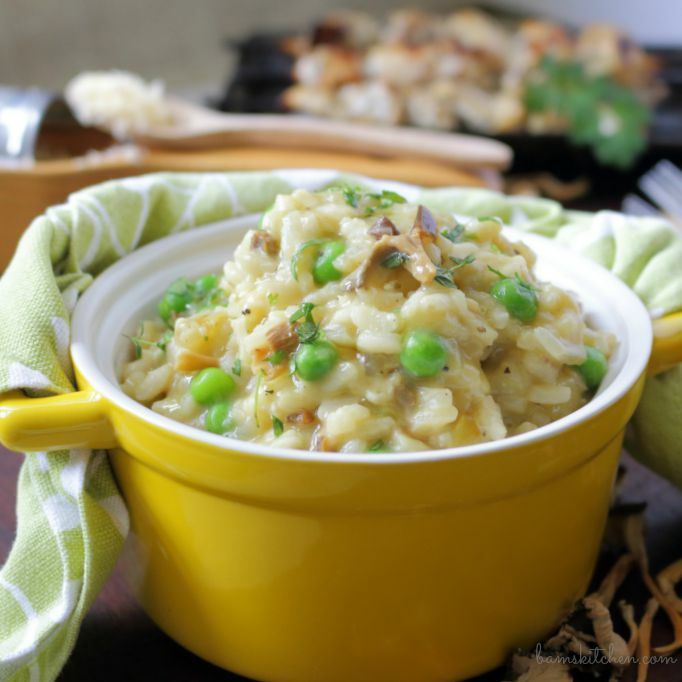 If you over cook your risotto, it will turn mushy like congee and that is not the effect we are going for here. 5Add thyme, parsley, peas and stir. Add grated parmesan cheese (if not dairy sensitive) and season with salt and pepper to taste and finish off you last stir with a dab of butter (optional). 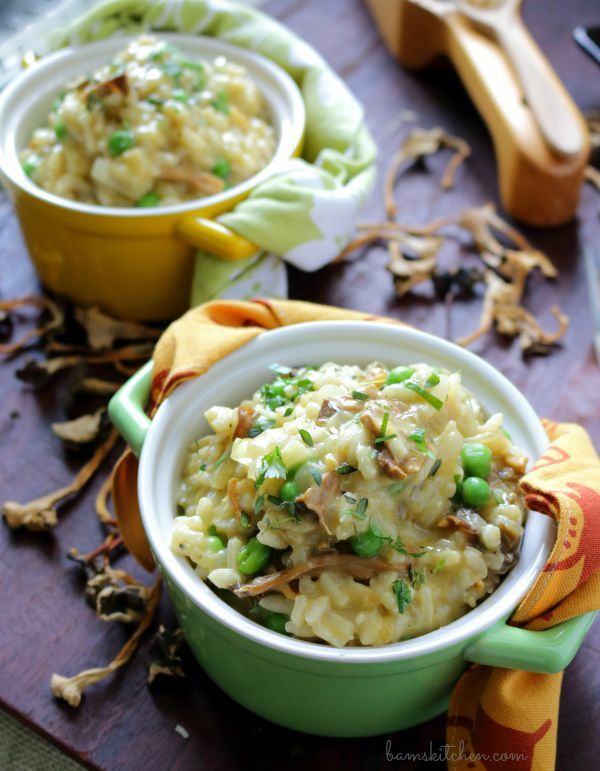 6Serve your delicious Chanterelle Mushroom Risotto as a main dish or as a side with grilled chicken skewers and enjoy.